With its tropical climate, Singapore provides the perfect setting to hit the water. Thus, waterskiing and other water sports in Singapore top the list of recreational activities for tourists. The waters on the coasts of the city-state can be described as having minimal wave disturbance. This means the waters are generally calm and devoid of large waves. This characteristic makes them very ideal for waterskiing and other water sports that do not require waves. Wakeboarding is another popular water sport in Singapore. In recent years, the sport has attracted an increasing number of people, thanks to the promotional efforts of the Singapore Waterski & Wakeboard Federation in partnership with major wakeboarding clubs. Some spots for wakeboarding include Extreme Sports, Maxout Hydrosports, and Launch Wakeboard School in Marina Country Club. Extreme Sports in Kallang Riverside has top of the line equipment and offers one-on-one coaching on wakeboarding. Maxout Hydrosports is located in Raffles Marina. Its rates are lower compared to the others. They often co-host Boardsailing and Wakeboarding championship events. Windsurfing is another sport that has gained popularity alongside waterskiing and other water sports in Singapore. It is particularly attractive to those who love the feeling of cutting through the water surface while riding a wind-powered board. It is best to go windsurfing on the months of July to October when the southwest monsoon blows, or on the months of December to February when the northeast monsoon blows. If you want to learn more about windsurfing, you can go to the People’s Association Sea Sports Club at East Coast Park or the Sea Sports Centre at the National Service Resort and Country Club for quick beginners’ courses. You may also rent windsurfing equipment in these facilities. Cable skiing is one of the more affordable water sports you can do in Singapore. Similar to waterskiing and wakeboarding, cable skiing involves holding on to a cord that is attached to an overhead cable. The cable usually hangs 8 to 12 meters above the water. As you ride the board, the cable will pull the cord forward, giving you an experience similar to being pulled by a boat. This water sport is comparatively less expensive compared to waterskiing and other water sports in Singapore, which is why it is increasingly becoming popular among the locals. You can go cable skiing at SKI360degree in East Coast Park, which has the only cable skiing facility in the Lion City. 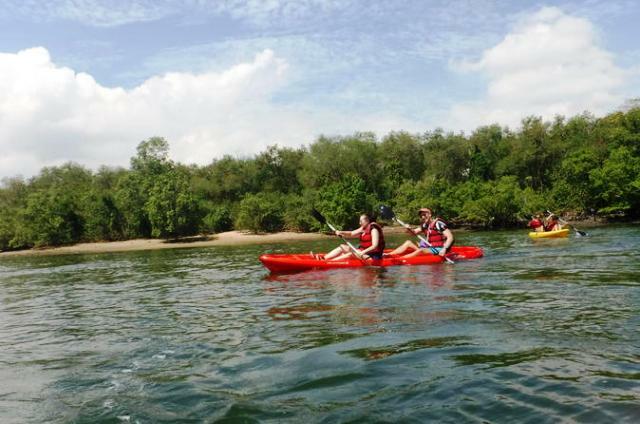 Canoeing is another water sport you can do in Singapore. You can try whitewater kayaking or sea kayaking. However, whitewater kayaking is only for beginners, as there are no rough rivers in Singapore to satisfy the urge of those who are longing for more adrenalin rush. Perhaps the most unique water sport you can experience in Singapore is wave surfing. Unlike waterskiing and other water sports in Singapore, wave surfing is done on simulated waves and not on the sea or river. Because Singapore has no giant waves that can accommodate wave surfing, Wave House Sentosa created a facility that simulates natural waves to provide wave surfers a venue to enjoy their favorite water sport. Surfers can now glide on the 10-foot Flow Barrel wave or the smaller Double Flow Rider.